In November, my wife and I moved about three miles, from Oakland to Alameda. 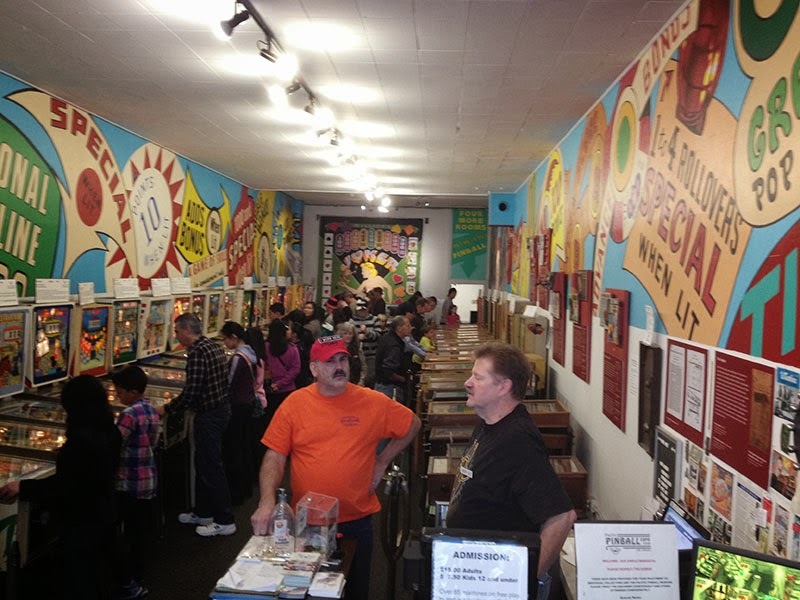 We now live about five blocks from the Pacific Pinball Museum! Alameda also has some pretty cool antique shops. Claire and I were wandering around one of them when we saw this backglass from Strange Scinece. I think it was like $100. Cool... but not that cool. Around Christmas, my sister Galen was in town to spend the holidays with her husband's family, who live in San Jose. We decided to all head to the Winchester Mystery House, which is one of my wife's favorite attractions. Claire and I made a trip there a few years back and there was a little arcade. Sadly, this has now been transformed into some sort of office space. Luckily, the Theatre of Magic machine that used to be there was now in the gift shop! This has become one of Claire's favorite machines, so she easily got a replay. We left the credit for the next person to come along. 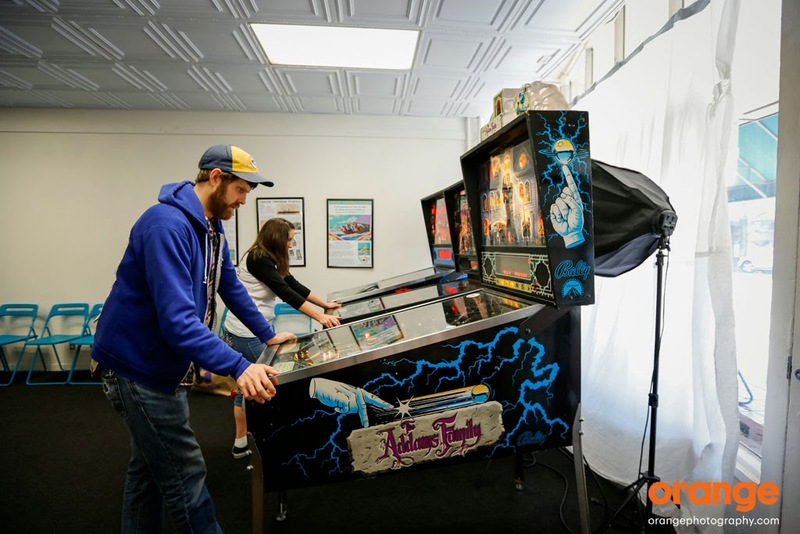 The Pacific Pinball Museum has a campaign going on right now to try and set up in the empty Alameda Carnegie Library. It's a beautiful space, which would more than triple their capacity, so if you can, please contribute! It really would be "the Smithsonian of Pinball!" 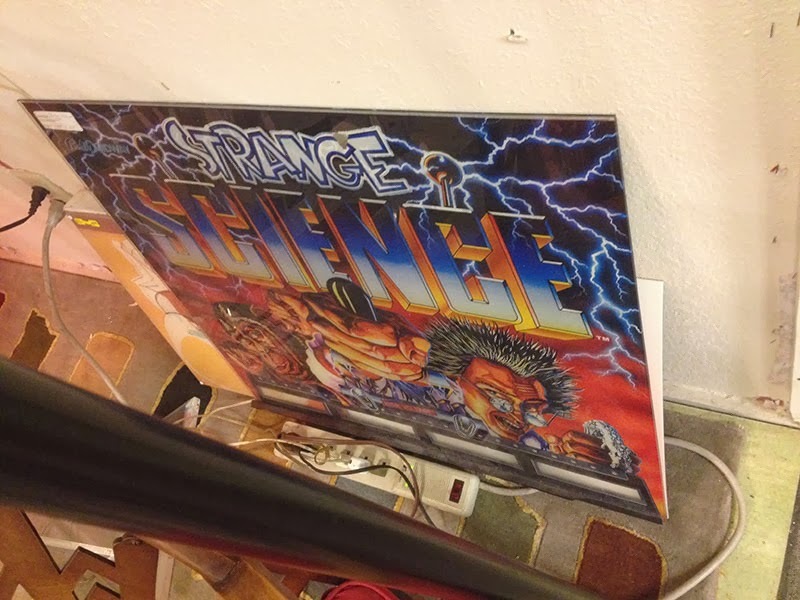 A few months ago, I got an email from a guy named Gene X Hwang, asking if I wanted to play some pinball. That same week I got an email from DTZ #5 contributor Ryan Claytor, telling me that he had met Gene at the Chicago Pinball Expo and that he was a cool guy and I should hang out with him. Good enough for me! 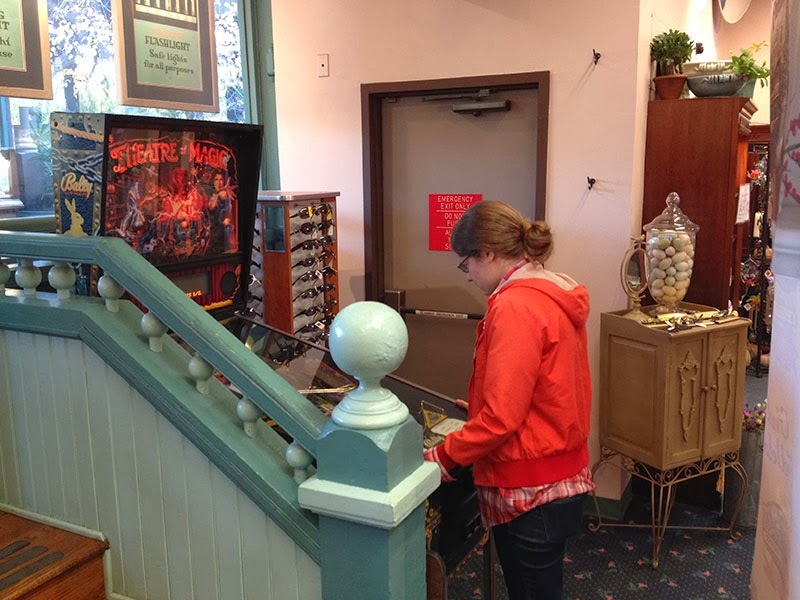 We met up at the Pacific Pinball Museum to play pinball for a few hours. We had a great time playing some two-player games, learning new machines together and dropping knowledge on each other when we could. It was very fun, non-competitive play. Now, Gene is not just a super friendly guy - he's also an extremely talented professional photographer and a contributor to various pinball podcasts. 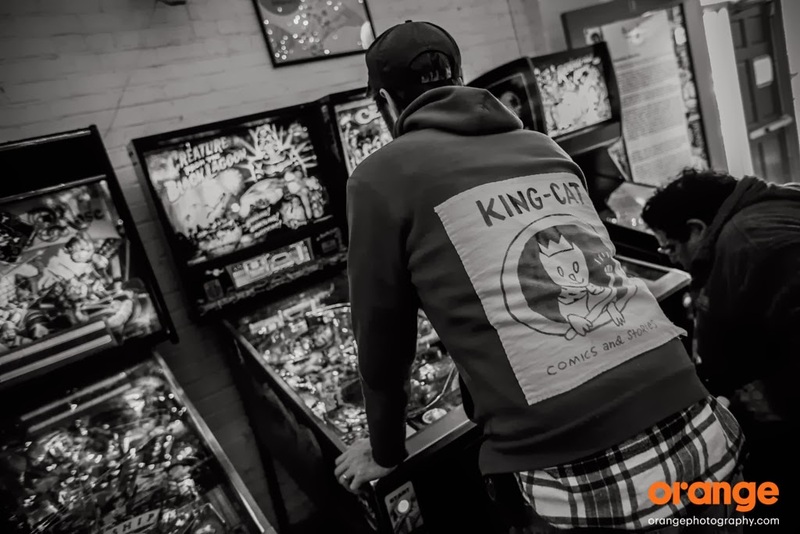 He took a bunch of photos at the PPM, which he said I could post here (check out his site to see a bunch more great pinball photos) and he also recorded a quick interview with me, which appears in this episode of The Pinball Podcast (towards the end). Anyway, it's nice to have a new Bay Area homie to play some pinball with, so hopefully Gene and I will play some more pinball again soon! 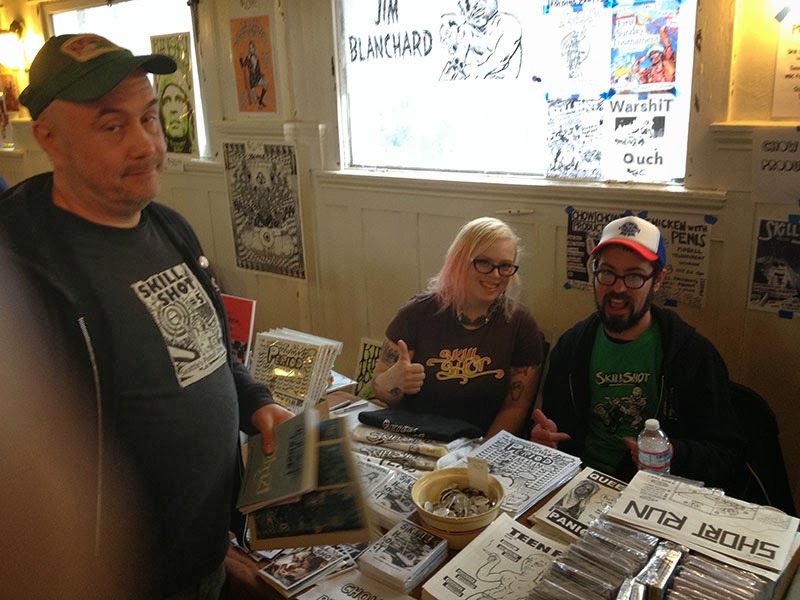 This year the Short Run small press festival in Seattle was held the weekend after Thanksgiving. That worked out great for me, because I grew up in Seattle and my parents still live there. My Mom hosted a huge Thanksgiving feast (21 people!) and then that weekend I went to the festival. While there, I ran into the folks who put out the excellent Skill Shot pinball zine! As a reminder, the first 66 people to order a set of Drop Target buttons, will get one of these stickers for free! While I was in Seattle, I also swung by Shorty's to play some pinball, because, how could I not?! When Jon came to visit me last July, we headed back to the East Coast together, to teach some of the summer workshops at the Center for Cartoon Studies. We had one weekend off between two week-long workshops, so you know we put that free time to good use! One guess where we headed... Yup! 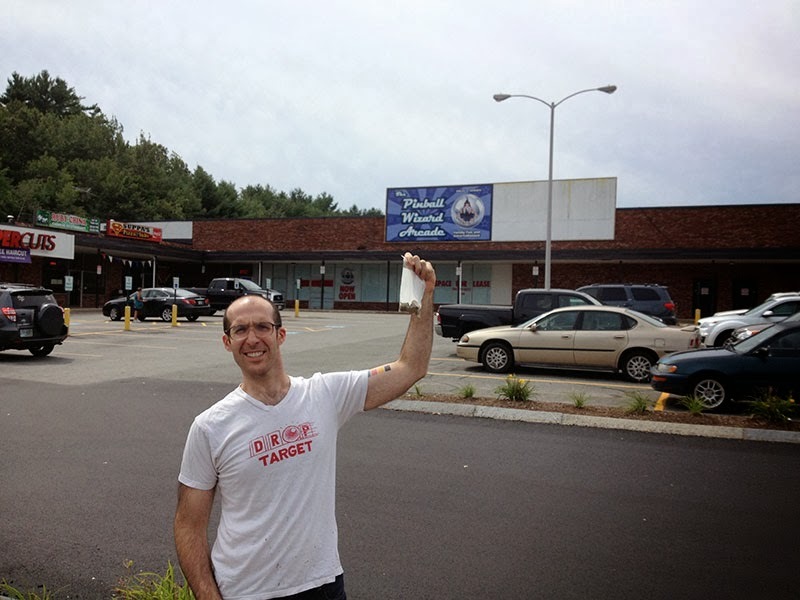 Pinball Wizard Arcade in Pelham, NH. Does this guy look ready to play some pinball or what??? I've been to a lot of good pinhalls, but this place is right up at the top of the list. The machines work great, the space is clean and inviting, the staff is helpful, and they have a TON of quality machise. Bask is the glory that is the PWA! 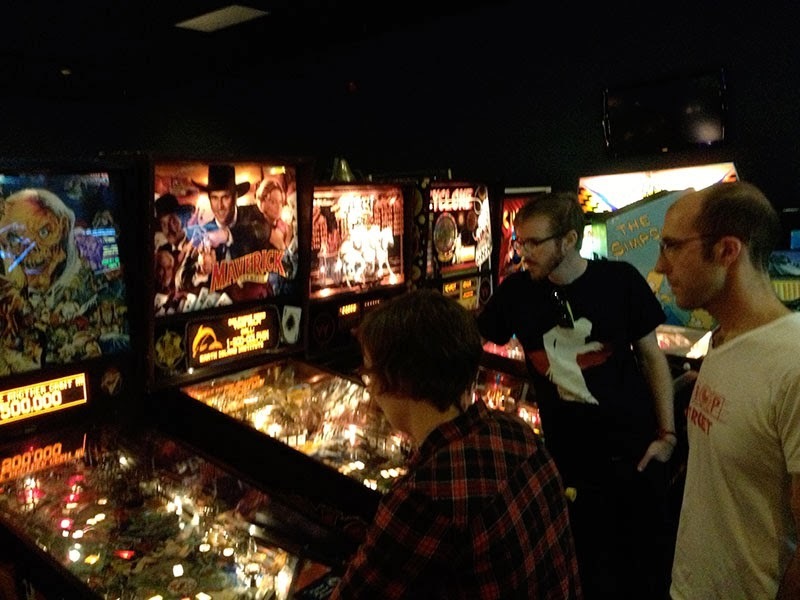 My pal Liz Prince had recently moved to Ipswitch which is pretty close by, so she and her boyfriend Kyle met us there to hang out and play some pinball. Here Liz is schooling us on Tales From the Crypt, which is her favorite pinball machine. PWA also had a brand new Wizard of Oz machine that Jon was really looking forward to playing (I don't think he had played it yet!) 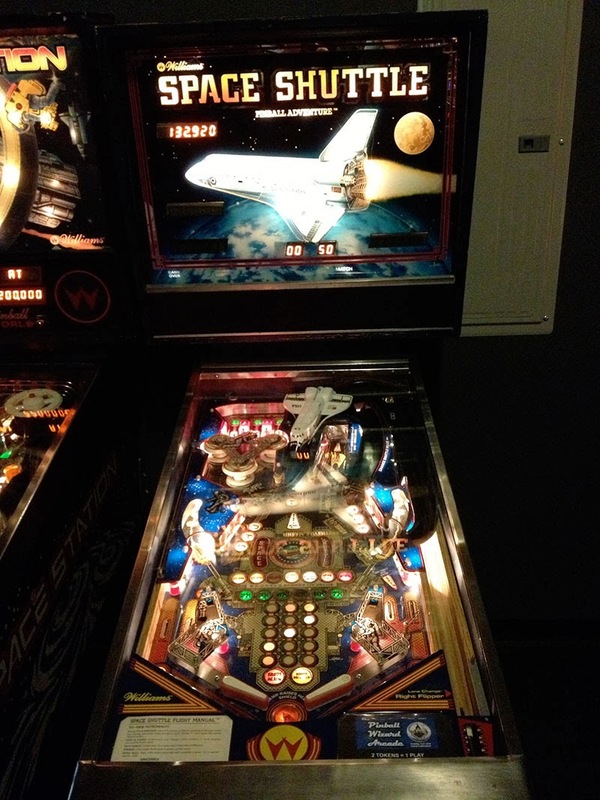 Unfortunately, the machine was having some trouble with its LED system, so none of the playfield inserts were working. They actually had this machine turned off, but since Sarah St. John is an old friend of the zine (featured in DTZ #4!) she booted it up just for Jon, and even put a credit on there for him. Class act! I remember playing a lot of Space Shuttle on this trip. There is something about this era of machine (mid '80s) that I love. Not so much stuff going on that you can't figure it out and just enough shots that it's challenging. But if you spend an hour with it, you'll hit every shot and run the machine through its paces. I'm not sure if 132,920 is a score worth bragging about, but I'm assuming I wouldn't have taken this photo if that wasn't my best game. Side fact for our cartoonist friends out there: this is James Sturm's favorite pinball machine! I flew back to Oakland, only to return to Vermont about a month later to teach a class, before heading down to the Small Press Expo in Bethesda, MD. Naturally, Jon and I squeezed in a few games of T2 at C&S Pizza in White River Junction while I was in town! 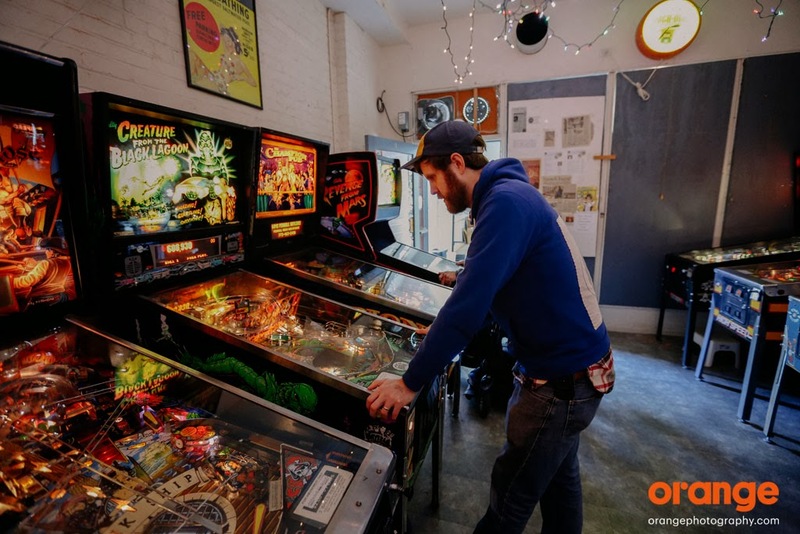 While this blog does serve as the official place for information about Drop Target Zine, it's also a pinball diary of sorts, where Jon and I try to document our experiences playing pinball. 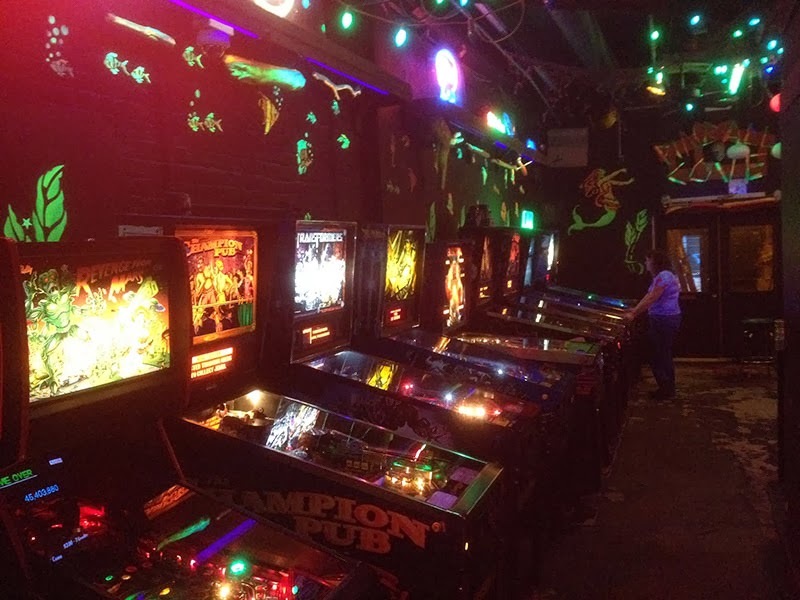 I always make sure to snap some photos when I'm out and about playing pinball, but I don't always have time to write up the blog entries to accompany them. I have some time now (having trouble sleeping tonight!) so I thought I'd go through some old photos and get 'em up on the site. Digging through the blog it looks like we left off just before Jon Chad was heading up to the Bay Area last summer. Jon had never been to the Bay Area before, and we don't often get to see each other now that we live 3,000+ miles away, so we were both pretty excited to play some pinball together! On Jon's first night in Oakland we did a "pincrawl" walking from bar to bar, playing as much pinball as we could. We decided to take photos of each machine and give them a thumbs up or thumbs down based on how well the machine played, and how well we did. So these aren't really reviews of the games themselves, just a metric of how much fun we had playing that game on that particular night. We started off at the Stork Club which had a busted up High Roller Casino and a South Park, which we both had pretty good games on. Next we walked a few blocks down to the Legionnaire Saloon. They had an X-Men, that, if I remember correctly, was having some serious flipper issues that made it pretty much unplayable. Their Scared Stiff (with a backglass signed by Elvira!) was playing great. We definitely played a lot of games on this one. They also had Metallica, which was brand new at the time, so we were both pretty stoked to get in a few games on that one. I don't remember playing very well at the time, but I've played this game a lot since, and I'm really starting to dig it. 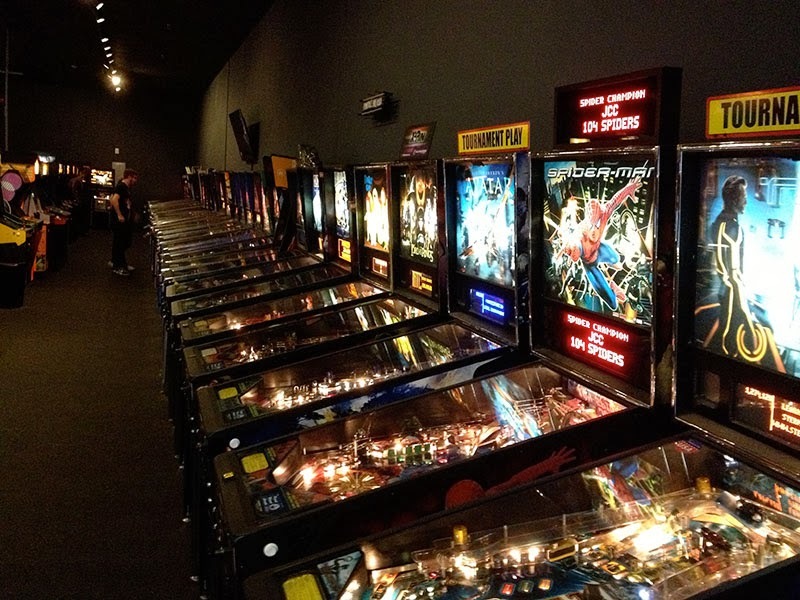 There is a lot of stuff going on and lots of opportunities for Multiball! We then walked over to Luka's Taproom which usually has a couple of pins in the back. Unfortunately, on this night they only had the Revenge From Mars Pinball2000 machine and it was completely unplayable. I think the right flipper kept getting stuck or something else fatal. We kept moving on, because we had bigger pinball fish to fry! Everything played GREAT and I specifically remember having a lot of fun playing White Water. It was the first time I really dug deep on that game, helped by some PAPA videos I had watched to get the flow down. This is the only high score photo I have from that night, but maybe that's just like a "best of the day" kind of score? Anyway, I'll take what I can get! Another big reason that Jon came to the Bay Area, besides visiting me and playing some pinball was to meet his book artist hero, Julie Chen. We got to visit her studio in Berkeley, which Jon will tell you was one of the coolest moments of his life! Afterwards, we went to play some pinball at Thalassa Bar & Billiards, which was a total bust. Both their ACDC and X-Men machines were overpriced and out of commission. 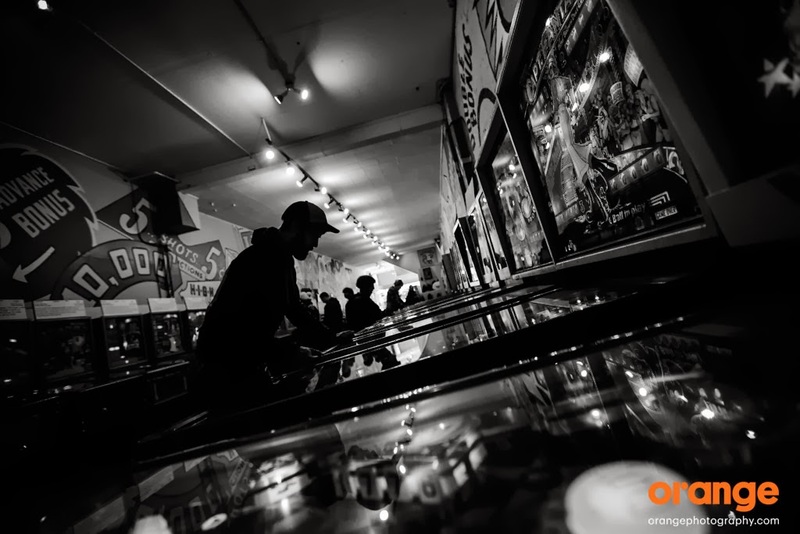 We ended Jon's trip out West in style, with a visit to the Pacific Pinball Museum! Needless to say, the machines were working great and we had a great time. This is one of the great pinhalls in the USA right now (in the world, I'd venture!) and it was super fun playing some of the classic games together. But wait! Our pinball adventures were not over yet! Next up: Pinball Coast to Coast!!! That's right, Jon and I designed some cool 1" buttons! We have about 100 of these, and we're selling them in packs of five for $3 (plus some shipping and handling). 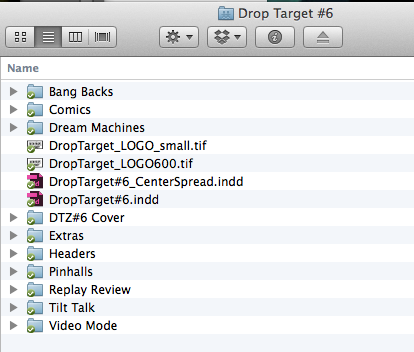 Each button features one design element from the covers of the first five issues of Drop Target. These are the perfect accent for your pinball repair backpack, your favorite pinball T-shirt or as a decoration for your pinball game room. They make a great conversation starter at pinball tournaments too! To celebrate the upcoming release of our sixth issue (due out this Spring! 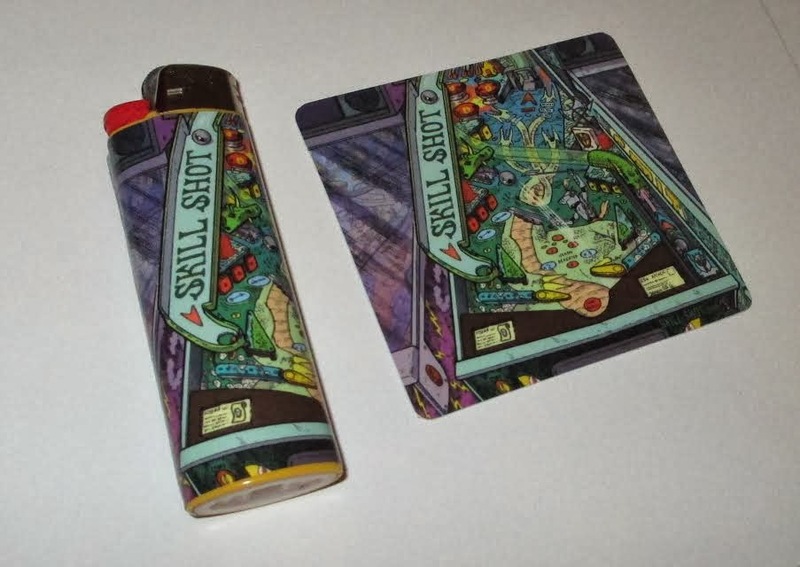 ), we're going to give the first 66 people who order a button pack one of Jon's Skill Shot lighter stickers for free (Bic lighter not included). You can order this over in the new "DTZ Extras" page, which is linked at the top of this site. They say a journey of a thousand miles starts with a single step. 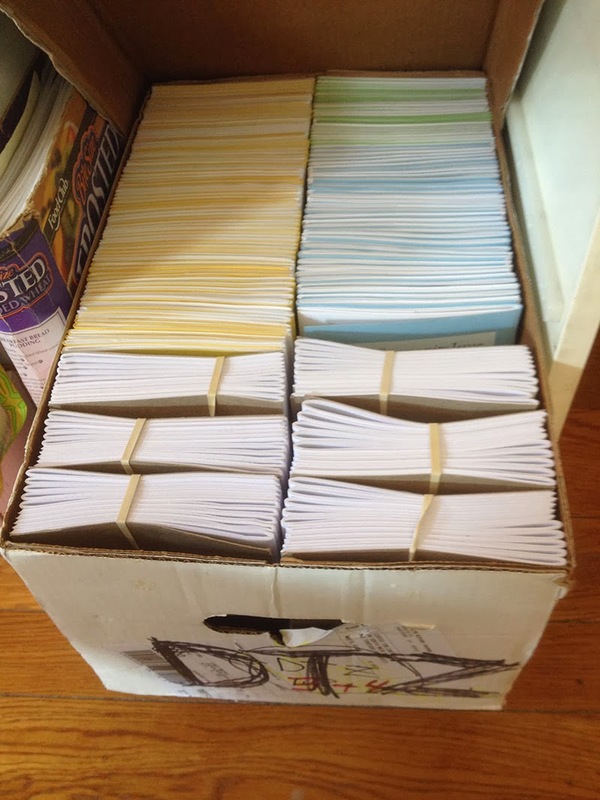 Well, a zine of 50+ pages starts with a single file folder! Yes, Jon and I are finally getting our ducks in a row to dive in on Drop Target issue 6, which will be out this year, hopefully in the Spring. We've actually got it all planned out, we just need to write some articles, transcribe some interviews and draw a bunch of pinball illustrations and comics. We'll keep you updated here as it gets closer to publication! It looks like DTZ #4 will be the next issue to hit its second printing, with issue five following closely on its heels. What's a matter? 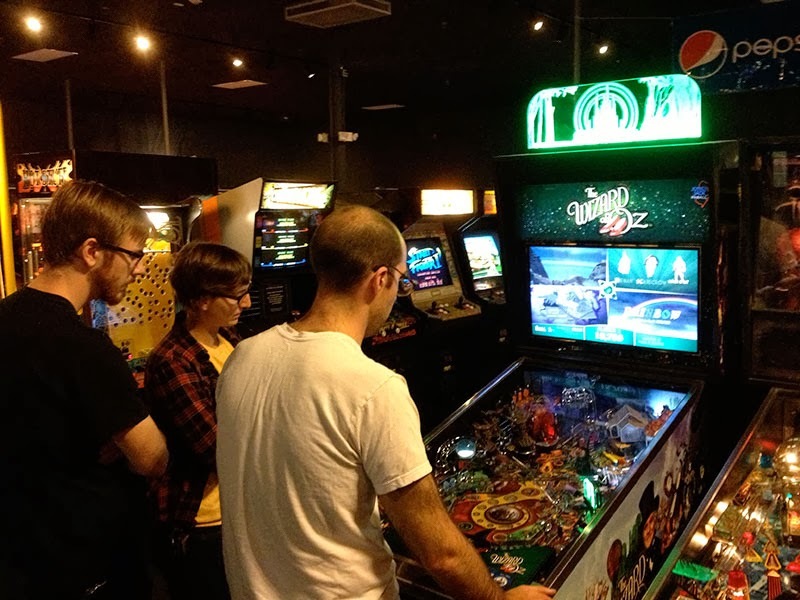 Don't people like classic pinball machines? Well, if you want one of these, hop to it! Once these first editions sell out (screen printed covers, full color center spreads) they are gone for good. 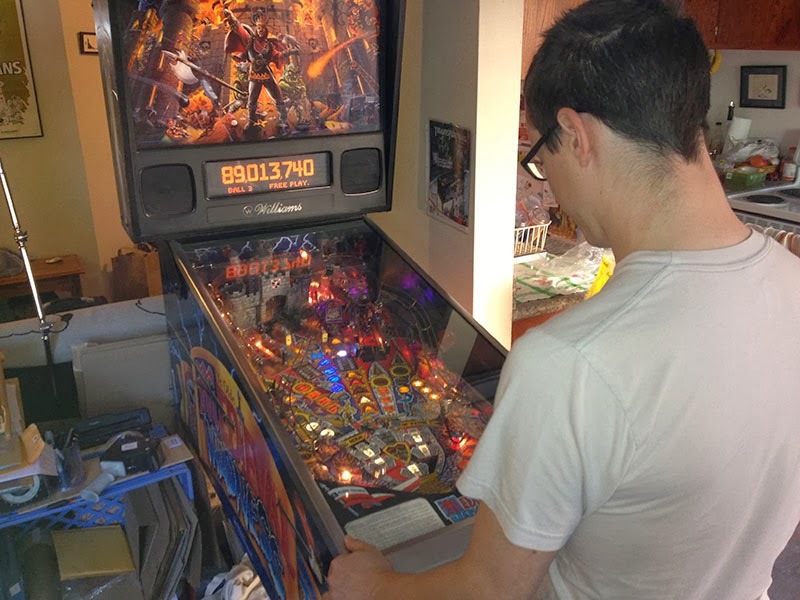 I'm going to try and queue up some posts to cover my pinball activity over the last few months. I've been pretty active, I just haven't had a chance to blog about it. I'll do my best to catch up.